is an enterprise level, mobile enabled, HIPAA compliant physician collaboration tool available for the iPhone and iPad developed by Click Care LLC. The Click Care system is capable of sharing images, text, audio, and video information in a secure manner. iClickCare has a web based companion (Click Care Classic) for use on desktop computers. The Click Care website has an excellent walk through to show how this collaboration tool could help your practice. 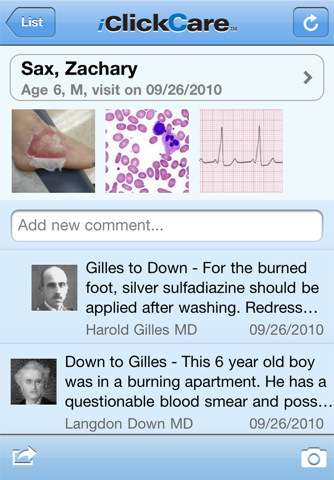 iClickCare appears to be an excellent addition to any wound care or home health practice. Due to the enterprise nature of this app, we are not able to do a full review of this app.